Text by Mark Weadick, photographs by James Fillmore. There’s a lot to see while walking Tubbs Hill. The surrounding beauty of the lake and mountains alone really makes the walk worthwhile. But what about the trees through which the trail winds? While some trees are nice and green, others are “sick”, dying, deformed and dead. The following is a narrative, with photos, of a walking tour we took on the afternoon of September 27, 2018. 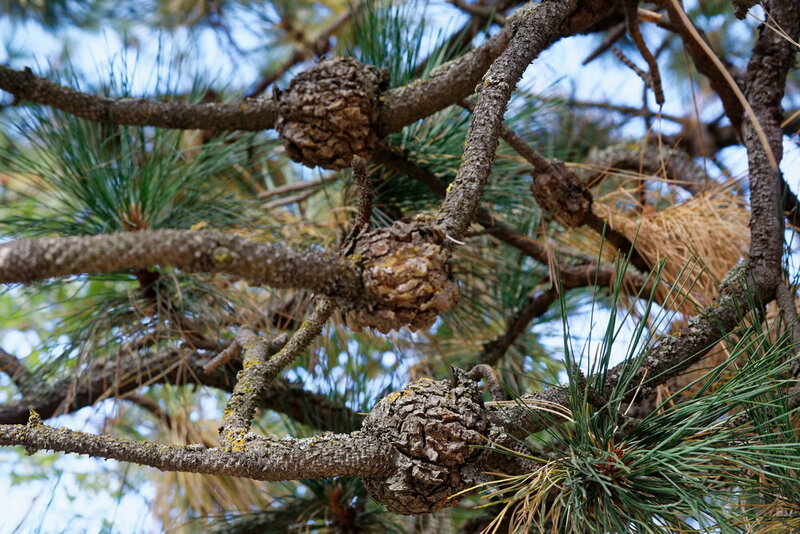 We started at the 3rd Street entrance and immediately noticed a ponderosa pine with lots of lumps on the branches. The lumps are caused by Western Gall Rust, a parasite that via spores makes it’s living on these branches. Eventually the branch will die, but it is a slow process and the ponderosa grows more branches faster than those that die from the rust gall. You will see these galls to varying degrees on other pines as you walk on the hill. We decided to leave the main trail and walk up the side trail that puts us on the Fire Road. On the way up we saw a ponderosa pine that died last summer from a Western Pine Beetle attack. The bark looks kind of weird since the woodpeckers have pecked off all the “picture puzzle” bark pieces while going after the insect larvae. We’ll get a closer look later.